Great CiviCRM meetup in Antwerp! 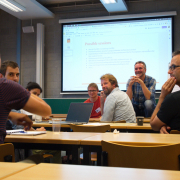 On Tuesday 11 September 2018 we had quite an enjoyable and interesting CiviCRM meetup in Antwerp. 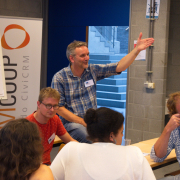 A total of 32 participants gathered at the University of Antwerp Middelheim campus to share their stories around CiviCRM. We did an introduction to CiviCRM for the people new to CiviCRM or deciding if they wanted to start using it, there was a session on memberships for a couple of membership organizations, I did a demonstration of my integration between CiviCRM and eenvoudigfactureren (online invoicing) for Domus Medica and Erik Brouwer facilitated a workshop on how to implement CiviCRM.